From Medicom. The Justice League get MAFEX figures from Medicom! Based on the forthcoming Justice League film, this 6' tall figure of Wonder Woman is exquisitely detailed and fully articulated. 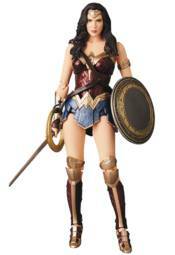 Wonder Woman comes with her sword and shield, plus two interchangable expressions and the cube from the film. Figure comes with a stand for easy display. SUICIDE SQUAD DEADSHOT 12" 1:6 SCALE ACTION FIGURE (HOT TOYS) WONDER WOMAN & BATGIRL DC BOMBSHELLS VYNL. BATMAN THOMAS WAYNE BATMAN FLASHPOINT US EXCLUSIVE POP! VINYL BATMAN VS SUPERMAN: WONDER WOMAN PATINA POP!